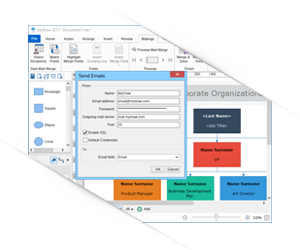 MyDraw is het beste afternatief voor Microsoft Visio® onder Windows en macOS (Mac OS X). Je kunt met MyDraw Visio® bestanden importeren (VSD, VDX en VSDX) om ze te converten en verder te bewerken onder macOS en Windows. Met MyDraw you kun je ook Visio® tekeningen exporteren (VDX en VSDX). If you are interested in translating MyDraw to your language, feel free to contact the MyDraw Team. Choosing between Windows and Mac has never been an easy task - whichever you opt for, there is always something that you need to give up. Luckily, with MyDraw this is not the case. Developed based on innovative technology, MyDraw is 100% identical under Windows and Mac. No learning curve, no different buttons or varying names: start using it on Windows and continue on Mac (or vice versa) and nothing will change. A GEDCOM file is plain text, containing genealogical information about individuals and meta data linking these records together. When the fields are matched you can select to either save copies of your diagram (drawing) for each value of your database or to directly send emails to all recipients. When working with large drawings you may need to visit some parts of the drawing much more frequently than others. In these cases you can take advantage of the MyDraw's bookmark feature. Bookmarks store a location and a zoom factor and can be used to quickly move the viewport to a given location and zoom in or out the diagram. Starting with MyDraw is as easy as it could possibly be - we've optimized it to match the interface which you're already familiar with and thus minimize the learning curve. How? - We've used the Ribbon UI that you recognize from the MS Office Suite and made it as simple as possible. If you like arranging your workspace according to your own preferences - MyDraw is perfect for you too! You can switch to command bars (MS Office 2003-like menus) with just two clicks and rearrange the commands as you see fit. MyDraw UI Themes - you can choose between several user interface themes to work in your favorite environment: Windows 8 or XP, Mac OS El Capitan and others. 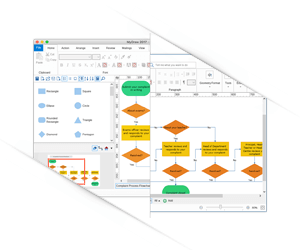 MyDraw is the best Microsoft Visio® alternative for Windows and macOS (Mac OS X). 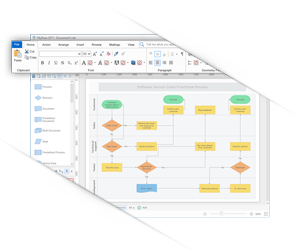 You can use MyDraw to import your Visio® drawing files (VSD, VDX and VSDX import) to easily convert your diagrams and work with them in Apple macOS and Windows Operating Systems. 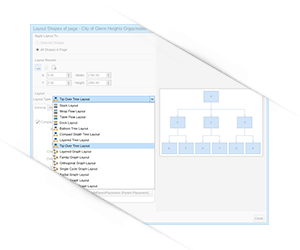 With MyDraw you can also export Visio® drawings (VDX and VSDX export). Users can take advantage of the Visio® stencil import (VSX, VSS and VSSX) and use Visio shapes in their diagrams. The MyDraw Team is constantly working on creating new templates and examples, new diagram shapes and symbols to support your work, now and in the future. Moreover, MyDraw allows you to create your own custom shapes, arrange them in libraries and reuse them within your diagrams. 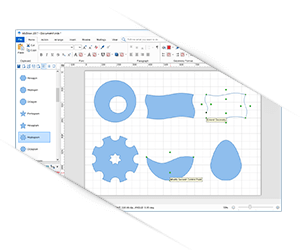 Visio-like "smart" shapes - MyDraw provides support for dynamic diagram shapes based on formulas. Custom diagram shapes development - if you require specific shapes, you can contact the MyDraw Development Team and request a quote. MyDraw comes with a large set of drawing tools which help you easily create any shape you need and style it to match your company's corporate identity or your personal demands. You can freely draw shapes using the Nurbs tool, or use the composing functions (Union, Intersect, Subtract, and Exclusive Or) to create new shapes from the basic ones. Additionally, you can combine simple shapes into groups and create advanced complex shapes. Save them in your own library for future reuse and edit them at any time. With MyDraw you can export your diagrams to images (PNG, JPEG, BMP and TIFF), or PDF, SVG and EMF vector files in just a few clicks. You can choose to export your images with high resolution, creating pictures which can be printed even on billboards. MyDraw allows you to select the margins of the page (i.e. how much space remains blank between the end of the page and the end of your diagram / drawing), the page orientation, the zoom level, and others. 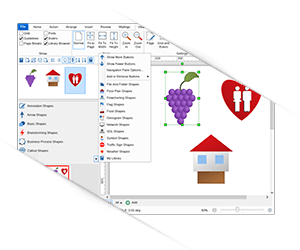 A great feature is the ability to specify each shape's permissions and make it unprintable - this will allow you to have shapes which serve simply the purpose of comment boxes or carry information which is not relevant to the printed version of your diagram. Simply create your diagram without spending additional time on aligning shapes and once you're done - go to the Arrange tab -> Layout Shapes button and arrange your diagram. 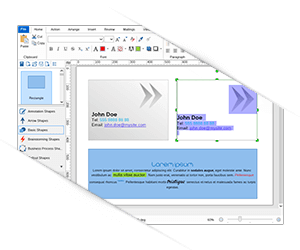 MyDraw has powerful support for rich text and text formatting. With the advanced text formatting features in MyDraw, you will be able to make your diagrams outstanding. You have control over the text font, text styles, paragraph alignment, bullets and numbering, etc. By default MyDraw comes with English (United States), Bulgarian (Bulgaria), German (Germany), Spanish (Spain), French (France), Portuguese (Portugal), and Russian (Russia) dictionaries. You can change the proofing language or load an external one from the Review tab -> Language button. The shapefile format is a popular geospatial vector data format for geographic information system (GIS) software.